If it were only a random arrangement of pen strokes de­signed to prompt the reader to say the sound “ah,”3 this question would be irrelevant. Every aspect of the alef’s construc­tion has been Divinely designed to teach us something. Contrast this with a child learning to read English for the first time. He is never taught why a capital “A” looks like a teepee and a small “a” looks like a soap bubble stuck to a wall. But Hebrew is different. The design of an alef is actually made up of three different letters: the letter yud or dot above; a yud or dot below; and a diagonal vav, or line suspended in between. The yud above represents G‑d, Who is above (or beyond) our comprehension. In com­parison to His true essence, our understanding is a mere dot. The yud below represents a Yid or Yehudim—Jewish people who dwell here on earth. The only way that we can grasp G‑d’s wisdom—to the extent that a person is capable—is by being humble. When we realize that we are but a dot or a speck compared to the All-Mighty and All-Powerful G‑d, we become a vessel to receive His Divine wisdom. The diagonal vav represents a Jew’s faith4—which unites him with G‑d. There is another teaching5 that posits that the suspended vav represents the Torah. Since the Torah is what unites a Jew and G‑d, the alef represents this unity between mankind and G‑d. This is the design, or form, of the alef. We can see that every stroke of the alef (and every other let­ter as well) has a special purpose, and that there is much more to learning the alef-beis than just mastering its sounds. On a more complex level, we explained that the form of the alef comprises three letters: two yuds and a vav. The gematria of the yud is ten—two yuds being twenty. A vav is six; the sum of all three totaling twenty-six. One of the great names of G‑d is the Four Letter Name י-ה-ו-ה, the Tetragrammaton, or Ineffable Name. The gematria of the Yud (=10), the Hei (=5), the Vav (=6) and the Hei (=5) totals 26, the same as the yud-vav-yud of the alef. 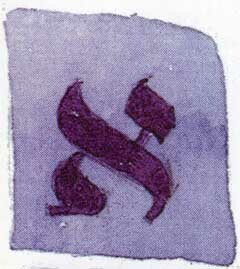 Through the connection of their respective gematrios, the alef represents G‑d’s Ineffable Name. Aluf’s definition is “master.” This lets the world know that there is a Creator; that G‑d is the Master of the universe, and that there is an Eye that sees, and an Ear that hears. The uni­verse did not simply emerge by itself; there is an omnipotent Force that actually forged the firmaments ex nihilo, from nothing to something. Thus G‑d is the Aluf, the Master of the universe. Ulfana means “school” or “teacher.” Not only do we introduce G‑d as the Creator of the universe, but also as the Teacher of all mankind. G‑d’s role as teacher is revealed with His introduction of Torah to the Jewish people. The Torah, with its 613 mitzvos or laws, teaches us what we should do, and what we shouldn’t do. Through the Divine wisdom of His book, G‑d establishes Himself in the world on the level of the ultimate Teacher. Finally, we have the third meaning of alef: peleh, “wondrous.” Peleh represents the esoteric or mystical level of Torah—Kab­balah and the teachings of Chassidic thought. Known as the “teachings of Mashiach,” these secrets of Torah comprise its greatest level. The Baal Shem Tov once entered Mashiach’s heavenly cham­ber9 and asked, “Mashiach, when are you going to come?” Mashiach responded, “When the wellsprings of your teachings (i.e., the teachings of Chassidus) spread forth throughout the entire world.” Thus, only when the level of peleh—this level of wondrous esoteric thought—has permeated the world, will the arrival of Mashiach be imminent. This can also be connected to a fundamental concept in the Talmud. The Talmud tells us10 that G‑d created the world to exist for 6,000 years.11 The first two thousand years are called Tohu, or chaos. This is followed by two thousand years of Torah. And the final two thousand are the days of Mashiach. What does this mean? Rashi explains that the first two thousand years began with the first man, Adam. This cor­responds to the first meaning of the letter alef: aluf—master—for the Midrash states that Adam caused all the animals and beasts to bow down to G‑d, thus acknowledging Him as Master and Creator of the universe. However, that era was qualified as chaos, because the Torah was not yet revealed. The second two thousand years, Rashi continues, began with Abraham. Abraham introduced the Torah. As the Talmud states,12 Abraham both learned and fulfilled the entire Torah long before it was physically given to the Jewish people at Mount Sinai. His embracing of G‑d’s word inaugurated the era of Torah—and thus the second meaning of the word alef—ulfana, or teaching. The final two-thousand-year period is considered the days of Mashiach; the concept of peleh. This wondrous era has the po­tential to usher in peace and tranquility throughout the entire world. Here, at this final level of alef, a teaching of the Baal Shem Tov illuminates an interesting point. The Alter Rebbe suggests that the difference between the words גולה—golah (ex­ile) and גאולה—geulah (redemption), is the presence of the alef.13 If one inserts an alef into the word גולה (go­lah/exile), exile is empowered and transformed into גאולה (geulah/redemption). Thus the final two thousand years of Creation, the era of Mashiach, is represented by the alef. Hav­ing been given the alef, the Jewish people are empowered to move from exile to redemption. The stages of G‑d as Master of the universe and as Teacher blossom into the days of Mashiach, when G‑d will be revealed on a wondrous level. All of this is contained in the letter alef. 1747-1812. The first Rebbe, or leader, of the Chassidic movement known alternately as Chabad or Chabad Lubavitch. HaYom Yom, entry for 8 Adar I. Kehot Publication Society, Brooklyn, NY, 1994; See also Likkutei Sichos, vol. 2, p. 616, Vaad L’Hafotzas Sichos, NY. The alef is actually an inarticulated letter whose sound is determined only by its accompanying vowel. The vertical line of the vav represents hierarchy: the submission of a subject to his king (as explained in the chapter on the letter hei). See chapter on the letter vav and Appendix 2. See also Likkutei Sichos, vol. 2, p. 616. Sefer HaSichos, 5751, vol. II, p. 523. As stated in the introduction, the letter pei is comprised of both a pei (which has the sound of “p”) and a fei (the sound of “f”). When calculating gematrios or in transpositions of letters in various words, the letters are considered the same. The introduction to Kesser Shem Tov of the Baal Shem Tov, Kehot Publication Society, Brooklyn, NY; The Religious Thought of Hasidism, Norman Lamm, Yeshiva University Press, NY, 1999, p. 550. After which the world will exist in an eternal state of peace and tranquility. Likkutei Torah, Behaalos’cha, p. 35c. As a carpenter employs tools to build a home, so G-d utilized the twenty-two letters of the Hebrew Alphabet, the alef-beis, to form heaven and earth. Letters of Light is a unique and insightful exposition of how the letters of the alef-beis continue to be a source of creation and inspiration. peleh-6000 Aleph is spelled aleph-lamed-pey. these same three letters in reverse spell peleh-meaning wonderous. In other Words if we go back to the beginning, to the essense we will find these wonders. The letters we see today were given by G-d on Sinai.